Now this is a very old favourite. I hadn’t made this soup in about 10 years as it comes from one of my first ever recipe books purchased way back when. I have no idea how authentic it is either, but delicious it certainly is! I’ve had a horrendous cold this past week and generally felt like a dog’s breakfast, so easy, warm and healthy meals have been the only option and while not feeling very creative, I found myself reaching for the old Farmer Brown Quick ‘n Easy recipe book from 1997. 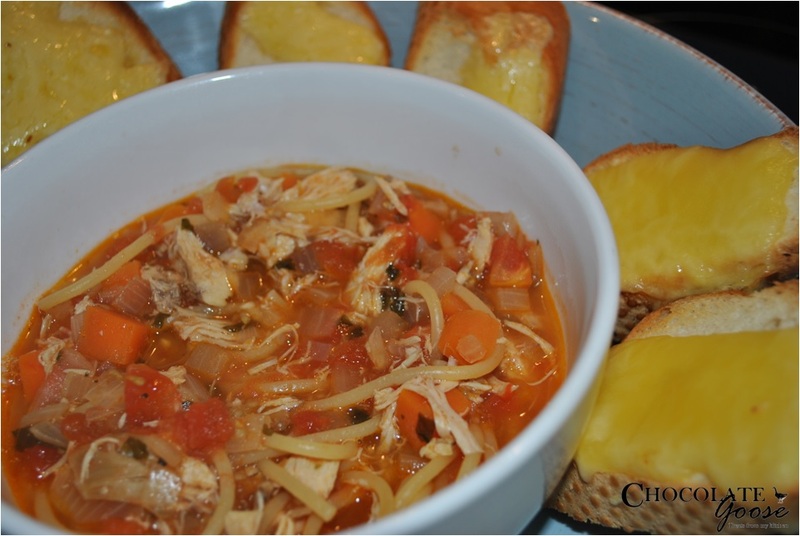 One of the reasons this is so quick to prepare is that you can use leftover cooked chicken. Add a couple of cups of stock and a tin or two of tomato and it’s almost done. Give it a try and let me know what you think. You can, of course, put a little more effort into this dish if you have the time and energy by roasting the tomatoes to get that beautiful deep flavour. Home made chicken stock is also another way to personalise the dish and is really easy to make. If you are using chicken left over from a roast, once you’ve removed all the meat from the bones, put the bones into a large pot. Cover them with water. Add a carrot, a couple of bay leaves, a few peppercorns, some celery and an onion and allow to simmer gently, covered, for about 15 – 20 minutes. Strain the liquid and discard the bones, bay leaves and peppercorns. I like to use the veggies in the soup as they already have the flavours and add a little more depth. Fresh chilli can be used, but we aren’t big on chilli so I always have a bottle of sweet chilli sauce in the fridge. A dollop of this was used instead. Peel and finely chop the garlic, ginger, onion and carrot and fry in the oil in a saucepan until the onion is translucent. Add the chicken (if using raw), stock, tomato (with all the juice from the can) and chilli sauce. Bring to the boil then turn the heat down to a constant simmer. If using cooked chicken, shred it and add it now. Add the noodles and cook until they are al dente. Serve, garnished with the chopped coriander or parsley.